and also other types for diverse purposes. For the years, Kua San Co., Ltd upholds the principles of “professional, quality, and integrity”, and is committed to provide the customized products and services to our customers. Kua San Co., Ltd introduces the wire drawing machines to lower down the cost and feedback the profit to customers directly. Automatic professional equipments not only manufacture products precisely and efficiently, but also deliver the orders with the shortest period of time. All the production processes are under the strict quality control to ensure the products with good quality before shipping out. As the company’s excellent brand and integrity of the supremacy of the services, Kua San Co., Ltd earned the respect and trust from customers and the metal mesh industry. 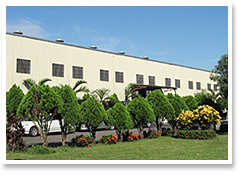 The products are sold worldwide.